When there’s so much to do between the deadlines, online shopping at midnight and catching up on Orange Is The New Black episodes, it is little wonder that you don’t have time for a spa session. So brands like Origins are stepping up on its masking range, so you can get your DIY facial done infront of the screen at home. I really like the new By All Greens deep cleansing mask. The creamy formula foams up like most oxygen masks when you spread it onto the skin. Made with green tea, spirulina and spinach, it perked up my skin like a vitamin shot. It felt plump and had a nice glow. My skin did not feel too tight and dry afterwards, while the pores looked finer too. Spritz on the Maskimizer Primer (which works like a regular skin softener) before applying the mask for best results. The new GinZing Peel-off Mask is a little tricky to apply. The formula contains quite a bit of alcohol, it can sting and smart the eyes as you try to apply it on your face. So put this on in a well-ventilated area and you will be fine. When squeezed out of the tube, the mask looks like liquid molten gold. Which makes it fun to wear around the house. Your husband may think you look cool with that golden complexion like IronMan. Apply a thick layer of this mask so you can peel it off. If not, remove with a damp washcloth after it dries. Spritz on the treatment lotion after to further soften skin. This duo left my face feeling softer, smoother, and more refreshed. 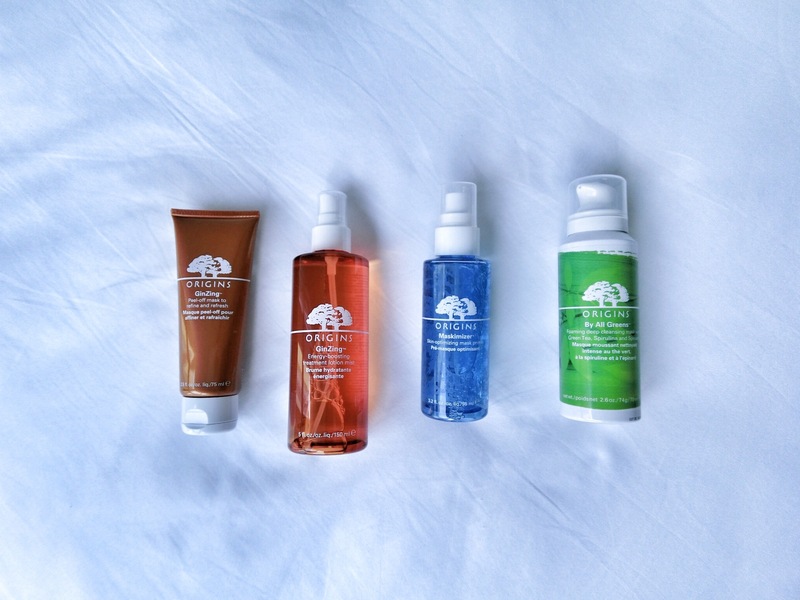 I love Origins masks and I really want to try the Maskimizer! Did you think it improved how the mask worked?? I’m glad to hear that it’s worth it, it’s definitely on my buy list now! Thank you! Really want to try more Origins products, I love the Drink Up mask!